Hello players. I am CCP Tallest, and this is a dev blog. TL;DR: We changed pickup locations, drop-off locations, and courier items in most of our basic courier missions. (Basic courier missions are the courier missions you get from a normal mission agent). For Tyrannis, we changed a bunch of basic courier missions, and I wanted to tell you why. The changes we put into place are based on two separate problems. I'll tell you a little bit about each problem and what we did to fix it. Problem 1: Planetary Interaction is using some of the same commodities as the courier missions currently in-game. · Changes to commodity volumes affect the commodities in both systems (PI and missions). · Because Planetary Interaction is using some of the same commodities as courier missions, players could intentionally fail courier missions in order to get the commodities, thereby affecting the player market for those commodities. · The massive influx of commodities from Planetary Interaction would make it easy for players to stockpile those items in stations close to their courier agents, thereby making the missions nearly insta-completable. What did we do to fix it? · We created courier mission versions of the PI commodities and used these new versions as courier mission items instead of using the Planetary Interaction commodities. o Example: In our courier missions, "holoreels" are now "crates of holoreels," and "datachip" is now "encoded datachip." · PI commodities have also been removed from all encounter missions. Problem 2: Courier missions were inconsistent between factions and levels. While studying our mission metrics, we noticed that players were running a lot more Gallente/Minmatar courier missions than Amarr/Caldari courier missions (see chart below). This chart shows the relationship between the numbers of completed level 2 courier missions for each faction block during Q4 2009. · Gallente/Minmatar courier missions generally had shorter travel distances than Amarr/Caldari courier missions. 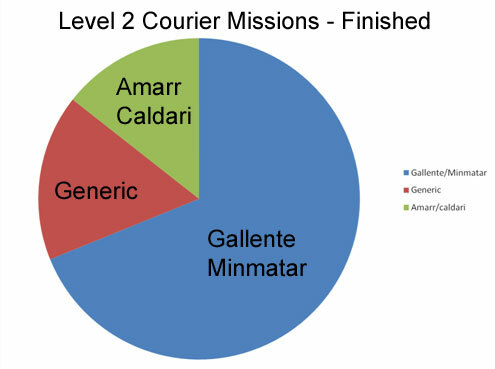 · Gallente/Minmatar courier missions generally had (far) less cargo to haul than Amarr/Caldari courier missions. · We also noticed that the progression between levels was practically non-existent. This also required changing. o Example: Several level 3 and level 4 courier missions could be run in shuttles, while some level 1 and level 2 missions required larger ships. · Giving one faction a clear advantage over another faction is necessarily bad; players of all factions should have access to similar resources. Balanced missions among factions also help to spread out EVE's population, which is good for the server and desirable for our population. Instead of fixing this issue by patching a few holes, we decided instead to do a wholesale revision to all of the basic courier missions in EVE. We decided upon a minimum and maximum cargo size for each level, as well as a standardized travel distance per level. · Level 1 courier missions: Cargo will fit into frigates, and the destination will be within your agent's constellation. · Level 2 courier missions: Cargo will fit into frigates, and the destination will be within your agent's constellation and/or a neighboring constellation. · Level 3 courier missions: Cargo will fit into industrials, and the destination will be within your agent's constellation and/or a neighboring constellation. · Level 4 courier missions: Cargo will fit into industrials, and the destination will be a neighboring constellation. Thank you for your time. CCP Tallest.